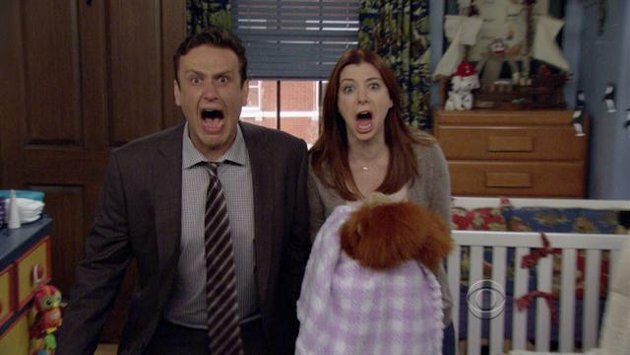 Dual Redundancy: TV Review: How I Met Your Mother 8x03: "Nannies"
DA- Oh why wasn’t this episode called Bangtoberfest? What’s Bangtoberfest you ask? Instead of not being the name for this episode it is an event Barney decides to throw for himself where he will learn to get over Quinn by of course banging some girls in the month of October. Even though the gang tells him he is not ready for any new relationships, with $7000 spent in merchandising and a T-shirt cannon Bangtoberfest and this episode is happening! Besides Barney’s bangs there are two main stories this episode. The first involves Ted and Robin competing to show which couple is clicking between Robin and Nick vs. Ted and Victoria. Despite already signing for Nick’s package, Victoria keeps tampons at Ted’s apartment, so advantage Mosby! As for Marshall and Lily they need a nanny and will not choose their dad who recently came to live with them after his house burned down. Where is Mrs. Featherbottom when you need her? After interviewing many weirdos they finally find one that works and is in their price range. The only thing standing in their way is of course…bangtoberfest! Barney, who was running low on creative pickup lines, decided to start holding nanny interviews to help raise Edgar as his new move. I would introduce you to him but he is currently asleep and he also doesn’t exist. Marshall and Lily’s perfect nanny decided to go work with Barney before she ran away from him disgusted by this ruse. Despite Marshall jumping for joy by having Hot Wheels in Barney’s apartment, this angers Marshall and Lily who just need someone to watch little Marvin on Lily’s first day back to work. Even though Barney is a womanizing con, he is no monster. He pays the large salary required for their top nanny choice but perhaps money was never the issue. Lily has a hard time letting little Marvin go. However Marshall does not care because the transaction included his Hot Wheels so all is well in the world of Mr. Erikson. Unfortunately for Barney all the nannies come together to attack him in the street and put a pacifier up a hole he cares not to mention. As for Robin and Ted, both agree that their relationships are not perfect (Nick is a sensitive guy that cries over football and Victoria is just a plain slob). They both agree to make them work but as we all know (and as Mr. Saget reminds us) neither will last. In the end Lily cannot let Marvin go and decides just to stay and nap with him. The only problem is that she wakes up to find a stuffed monkey in her hands! After a brief moment of panic and a break in the fourth wall, Lily’s dad, as it turns out, decided to take care of little Marvin for the day. (After first replacing him in Lily’s arm by a sub and later the monkey once he got hungry). Lily is then reminded that he was once a stay at home dad before his gambling addiction and that he is capable of raising a child. He will even run into a burning house for a child photo album (and for potato salad of course). While he may have been missing in the past he is here now and that is what counts. One person that I am surprised to still see around at the end is the nanny Barney bought for Lily and Marshall. To perhaps get every bang for his buck, Barney after first hiring her to help coach him in his creative pickup lines, sleeps with her. Not just once but five times! Talk about a deal! While we all know this will not be Barney’s wife, could this new character be the woman we all have been waiting for? Is she perhaps Ted’s wife and thus the mother?! Only time will tell…but I’m seventy-five percent sure she isn’t. Episode MVP: Mickey Aldrin (Chris Elliot) who always delivers in every performance. I really liked this episode of How I Met Your Mother! This season has exceeded my expectations completely so far. I have been watching this show since season 1 and I am always recommending it to my coworkers at DISH. I really like where this season seems to be going, so I'm glad my Hopper will record every episode with the PrimeTime Anytime feature, so I don't have to worry about missing an episode. I am really excited to see next week's episode, especially because it deals with godparents! We shall see who ends up being Marvin's!